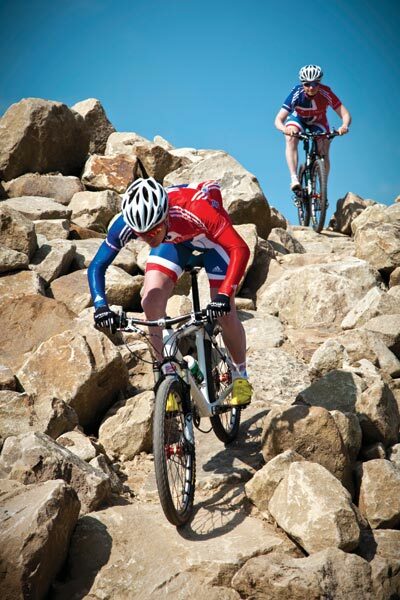 Olympic podium prospect Liam Killeen has declared himself well suited to the London 2012 mountain bike course after the completed circuit was unveiled in Hadleigh, Essex, last week. Based on a surprisingly high hillside above the Thames Estuary, the 5km course features six pronounced climbs with several more, shorter kicks that add up to 170m of altitude gain each lap. Killeen, who took a fifth place in the cross-country at the Athens Olympics and seventh – despite crashing on the all-important first lap – in Beijing, told Cycling Weekly: “I like the nature of the climbing. It’s more out of the saddle and punchy as opposed to long seated climbs. “A lot of courses are becoming like this with a short, condensed lap,” he added. “You get a lot of short, sharp climbs and not a lot of transitional sections – there’s no real backing off. Purpose built specifically for the Games, the course is also surprisingly technical with a number of rock gardens and steep drop-offs built from imported Derbyshire gritstone. Designed to cater as much for TV coverage as atmosphere on the ground, the course is by and large set on open farm meadows, meaning little in the way of tree cover to shade riders should it be hot when the Games take place in August next year. The openness also offers great views. Chair of the London Organising Committee Seb Coe may have been stretching the point when he called the mountain bike course “one of the most beautiful venues I have seen in the world,” but there is something spectacular in the vista across the marshland and housing estates of Canvey Island to the industrial chimneys and pylons on the other side of the estuary in northern Kent. Southend Pier and the nearby ruins of Hadleigh Castle are also visible from the course. Although as contrived and artificial as the Dutch white-water-rafting I’d recently seen on TV, the Olympic mtb cross-country course in Essex makes for both a physically tough and technically demanding lap. From the wide start loop, a narrower zig-zagging climb takes you up to a rock garden where the quickest line through puts you straight over a sharp drop-off. Another longer boulder-strewn descent follows. Taking the smoother ‘chicken run’ is only an option for tired and out of contention racers; course builder Martin Seddon reckons it will cost at least six or seven seconds. A penalty for taking the less challenging line is repeated on several of the technical features on the course. Inevitably, a short climb follows the descent, before some North Shore-style woodwork offers two routes around a tree. The faster line here features a gap jump over a knobbly bed of boulders. I wasn’t expecting this on a cross-country course and only just about cleared it. It wasn’t a pretty landing, either. The entire course is contained in a pretty small area, looping back and forth, seemingly always climbing or descending. There are no long climbs – but several blasts of a minute… or two, depending on who you are. 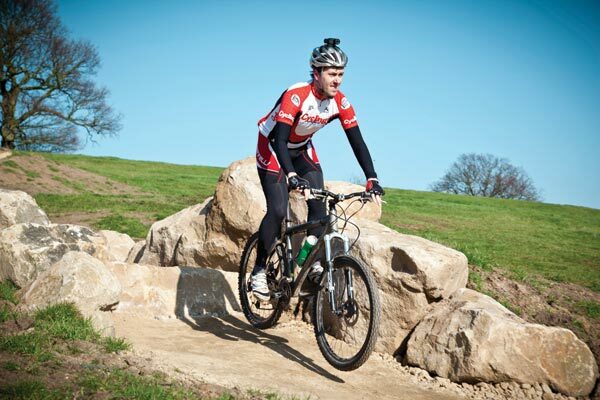 Although much of the course is artificially surfaced with a compacted crushed stone, there are also open sections on grass and a streak of singletrack between hedgerows. A couple of steep rock drops required a health and safety talk from our guides and then the mustering of bottle beforehand. However, all were manageable to my moderate ability, although I couldn’t clear one technical section of climbing without foot dabbing. The highlight of the course is the fast-flowing, beautifully bermed descent that gives just reward for topping a steep and straight grassy climb that’s been given the working title “Cardiac”. It’s a shame that the course will remain closed to the public in the run-up to the Games. Two laps of the circuit proved lots of fun. Eight laps at race pace will require a suitably Olympian effort.